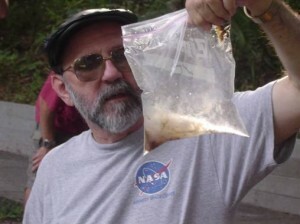 Aaron L. Mills, Ph.D., examines a microbial mat from Wekiwa Springs State Park. Dr. Aaron L. Mills is a professor of environmental sciences at the University of Virginia. He is a highly respected scientist and educator whose work bridges the biological and physical sciences. He is widely recognized for his close collaboration with physical scientists in studies of microbial communities in the subsurface. He and his colleagues have made significant contributions to understanding microbial transformations of organic and inorganic pollutants and the transport of bacteria in groundwater systems. While serving as Chief Scientist at NASA, Dr. Mills’ work on the role of microbial community structure in community functioning in foodwebs and in mineral transformations made critical contributions to NASA’s manned space flight program. Most notably, his work with NASA provided the scientific underpinnings for developing ways to maintain atmospheric conditions and food production for long-term space flights. Dr. Mills’ application of geostatistical approaches to understanding the spatial distribution of microorganisms in soils has lead to important insights into ecological phenomena such as stability and resiliency in microbial communities. 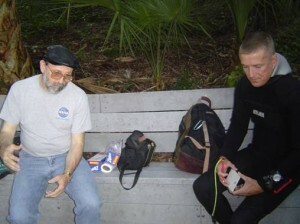 More recently, through his association with the Cambrian Foundation, he has combined his interests in subsurface microbial ecology with his work on structure and function of microbial communities to examine chemoautotrophic bacterial communities as the base of cave food webs and the role of associated heterotrophic bacterial communities in retention and recycling of nutrients in subterranean ecosystems. Dr. Mills discusses sampling strategies with research diver Terrence Tysall prior to a dive. Dr. Mills has authored or co-authored 2 books, edited and contributed to 23 books, and written over 100 scientific papers. In addition to being a prolific writer, he serves on numerous professional journal editorial panels, National Science Foundation review panels, and has carried out work for the National Research Council. As a consequence of his active research program in the broad area of microbial ecology, he was elected to membership in the American Academy of Microbiology. Dr. Mills was born in Jamestown, New York. He earned his B.A. degree in biology from Ithaca College, NY, in 1970, and his M.S. and Ph.D. in Soil Science from Cornell University, NY, in 1973 and 1976, respectively. Following graduate school, Dr. Mills completed a postdoctoral fellowship at the University of Maryland in microbiology before joining the faculty at the University of Virginia in 1977. He has been a full professor since 1991.